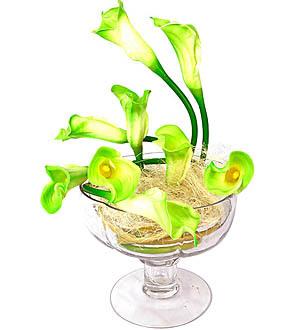 Dramatic, contemporary and very stylish, our calla lilies arrangement are in timeless classic greenish white. Beautifully detailed for absolute authenticity, the graceful flowers and elegant slender stems are complemented by a chic Morsey clear footed vase. The contemporary, modernistic effect is enhanced by the distinctive vase which is suitable enough to fit elegantly on any low furniture and table top . Flower Arrangement measures 48cm in height with a diameter of 37cm.